Do you have one area of your house that is constantly changing or that you always want to change? One of those areas in our house is the mudroom. It’s a great area just off the garage that is perfect for setting my purse, keys, and whatever else comes into the house with me. Even though the result was better than the “Before” I wasn’t thrilled with my fabric choice. Truth be told, I immediately wanted to change it, but that didn’t happen until last weekend. With endless fabric options, it’s so hard to narrow it down! Luckily, switching it up is easy!! I simply recovered the bench with the new fabric. This time I went with Dwell Studio Bella Porte Brindle. I haven’t made any coordinating pillows yet, but I like the change. Dwell Studio’s fabric line is so graphic, modern, and fun. This particular pattern comes in other colors too- the navy is my favorite. Now I want to cover my big, brown leather ottoman in some fun fabric but I can’t figure out how to dismantle it! I may have to sell it and buy another inexpensive one that I can recover. Just need to find the perfect size. 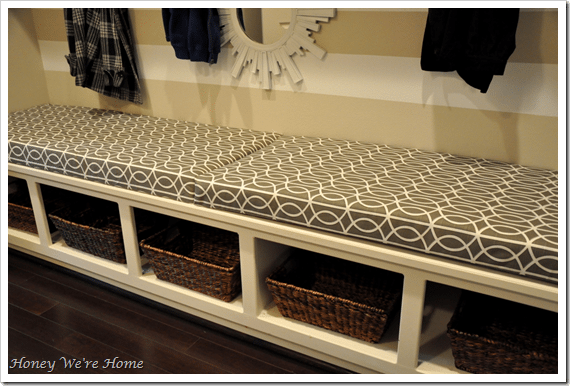 See the updated DIY envelope pillows and painted doors. 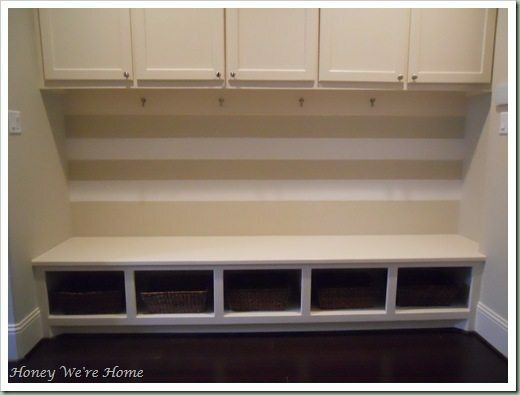 See how we’ve organized our mudroom here. Oohhh I love the new fabric so much more! Quite the update. And how in the world are you able to keep fresh flowers on your ottoman?? Is that just for photo opps or is James a Saint? I can't wait till I can decorate the tray on our ottoman with pretty stuff, but that won't be for a while. Hmmph. The first makeover was a huge improvement, but I much prefer the second one. The cushion fabric ties in so well with the stripes and all the colours seem to mesh together seamlessly. It looks polished and 'wow' at the same time! LOVE the new fabric on it. Such a difference. It's so fun to switch things up like that. Have you started packing?? Love the new fabric choice!! I liked it before, but love it now! And this is getting weird — I was looking at that same fabric online today to put in our bedroom. They have so many amazing options! Wow. What a difference! I liked it before, but now I LOVE LOVE LOVE it. So chic. So funny–I am on fabric.com as we speak… searching for fabric for curtains for our great room. And for the new nursery. Too many choices!!!! Great choice, it looks amazing. Can't wait to see what coordinating pillow fabrics you pick! (ok that sounds kind of weird and overenthusiastic, but I really am excited! ha) Dwell Studios always has adorable prints. I loved your fabric before but now that I see the new fabric I'm so much more in love with it. It fits the space perfectly and pulls it all together! The mirror is super cute there! That is awesome! It went from good to GREAT! Sooo nice!! Good job! It's such a beautiful piece, it seems a pity to send it off . . .
Love the change! That fabric is awesome. I am with those before me who say slipcover the ottoman…that way you can always wash it. i love the new makeover…i cant wait to see what you'll add in that space soon! The contrast of color and scale of the pattern really work a lot better now. Love it, and love Dwell! I thought it looked great before, Megan, but the after is really fabulous. I love that fabric, and especially the neat pattern. I'm looking into going gray in the kitchen and dining room, and wondering what color fabrics I should do for my window treatments. I like the pattern you have! As for the ottoman, why not do a tight-fitting slipcover than ends where the legs begin? That way it would be washable too. Ooh, I love the second fabric. The first makeover was a huge improvement, but the fabric in the second makes all the difference. Thanks for the inspiration today! Looks great, and Dwell has done a great job making coordinating pillows that aren't overly "matchy." That's one enviable mudroom! I must say that the first fabric did not seem like you, I even thought that when you first revealed it. (That sounded a little odd, you as in line with the other choices you have featured on the blog). I love the new fabric! You may be able to still recover the ottoman with the leather.. I recently purchased a nearly brand new ottoman (brown leather also) from Goodwill. My hubby has been saying for days how beautiful he thinks it is and how I should leave it alone. I have differant plans for it though and plan on recovering it with a mod fabric with shiny weathered nickle nail head trip since nail head seems to be the new rage. If I were you I would look and see if the ottoman has a ledge.. Mine does which means I shouldnt have to pull it apart just add the new fabric ontop and secure it tightly under the ledge.. Hope this helps! I love that fabric! We are using the exact same one for my husband's mantastic bachelor days wing chair. 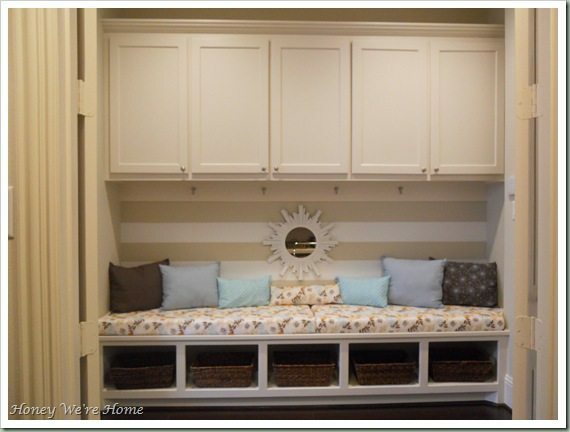 my wife would love to have that mudroom… actually, i would, too! Love the new fabric choice!!! Great job Megan! GREAT job! The new fabric looks fantastic and I hope to use your tutorial soon. Lovin the fabric. I am a sucker for fabrics with cool modern patterns like that. I especially love that yellow pillow! Love the new fabric for the seat cushion. I have been eyeing the exact same fabric myself. Love the idea of covering your ottoman! I never would have thought of that. Can't wait to see it if you do! I really love the change. That is one of my favorite fabrics. I love that it's on a big piece so you can really see it! LOVE that fabric! Also love your office makeover….grays and yellows are my new thing too! Always look forward to your blog each day! I almost bought that exact fabric to make curtains for our bedroom. Good choice! I loooove how it looks up against that striped wall. Looks great. Loved it before but the new fabric anchors the space wonderfully. And..I'd love to hop over and figure out how to cover that ottoman with you, I'm sure it can be done! The fabric is perfect. It makes the space! I adore the new fabric you chose! I think it totally reflects the style of the rest of your beautiful home. I'm hoping to recover an ottoman for our living room as well, and I'm searching for fabric for that project (and curtains…and pillows) right now! I love love love the new fabric choice!! Love that fabric! Great choice! And all your new goodies and you office. I wish I could move into your home;). Great fabric choice, Megan! It's fun with your striped wall. I am eyeing some…actually, all of those pillows. That is a perfect size ottoman you have. I see others have suggested a slipcover which is what I was thinking as well. i thought it looked awesome before, but now- shaboom! it looks gorgeous and more modern! Wow, I liked it before but I LOVE it now! Great choice on the fabric and adore all your pillow choices. My husband would have thought I was nuts for changing it, but I know how you feel when something isn't quite right. Definitely prefer the new fabric – so stylish! 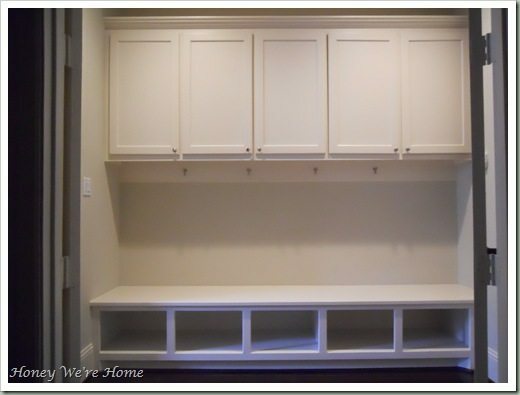 I am so jealous of your mudroom! Ooh, I love the new fabric!! It looks wonderful!! I LOVE it! So much better! I'm on the search for modern fabrics so I can make some new pillows. I do indeed love your mudroom AND the new fabric! Dwell Studio is always a good choice, I absolutely love everything they have and the circular pattern of the fabric you chose is a nice compliment to the stripes! Absolutely Fab – love the new fabric!! Can't wait to see which pillows you choose. Love the update! And call me crazy, but I sort of love how it looks without the pillows. Either way will look great! I have a similar shaped fabric ottoman. I was thinking about having it professional recovered, but now am just thinking of sewing a slipcover with a 4-5" ruffle at the bottom. Love the fabric and the pillows you posted. I absolutely adore grey/slate and yellow! 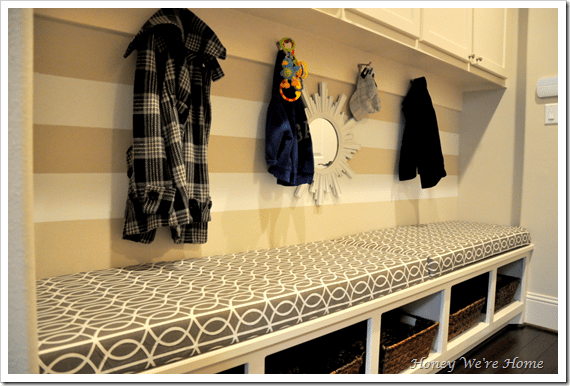 Your mudroom is awesome!I really like the new fabric. You took something fabulous and made it surreal. I LOVE the new fabric. If there was ever a fabric that screamed you…it is that. I also heart that lumbar pillow with the birds…so cute. This is awesome. I love the makeover you made. Love the new fabric too. LOVE the fabric update…so much more 'megan' And wouldn't you know, I've got a sample of that very fabric on back order!! How about making a little throw out of some fun fabric for the ottoman…at least until you figure out how to cover or get a new one? It'd be a nice splash of color. Almost like a table runner…would that be odd? I absolutely ADORE your new fabric with those stripes! What a great space to come home to! ok, I have to tell you that I've been looking at your mudroom over a zillion times admiring it all! I ordered my fabric and had to wait several weeks to get it since it was out of stock BUT it finally came this past and I JUST FINISHED my project yesterday! I'm so pleased, thank you! I don't have a very good eye when it comes to choosing fabric and thanks to your ideas my mudroom looks so much better! Keep the fabulous work! I just started following your blog and have been playing catch up for the past week or so.